OXFORD, Ohio – Thanks to a three-goal, third-period outburst, Miami’s seven-game winless streak is over. The RedHawks beat RPI, 4-2 at Cady Arena in the series finale on Sunday, giving the team its highest offense output of the season and its first win since Nov. 7. Like Saturday, Miami took an early lead but managed to fall behind. RedHawks senior forward Andrew Schmit banged home a loose puck at the top of the crease for his second goal of the season at the 2:01 mark. 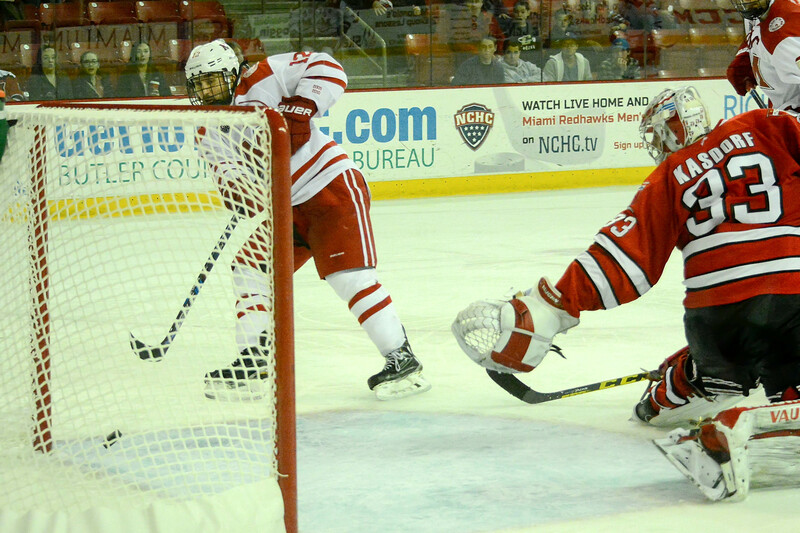 A turnover by senior defenseman Matthew Caito led to a breakaway by RPI’s Jesper Ohrvall, who buried a shot on the glove side of Miami senior goalie Jay Williams, tying the score with 9:20 left in the opening stanza. The Engineers went ahead when Jake Wood ripped a shot past Williams on a shorthanded chance after a stretch pass by Jimmy DeVito with 6:52 left in the second frame. But after failing to score in their previous five third periods, the RedHawks dominated the final stanza. Alex Gacek taps home the tying goal on Sunday (photo by Cathy Lachmann). A shot by senior center Sean Kuraly was deflected to the side of the net, where senior forward Alex Gacek banged it home to tie the score at two. 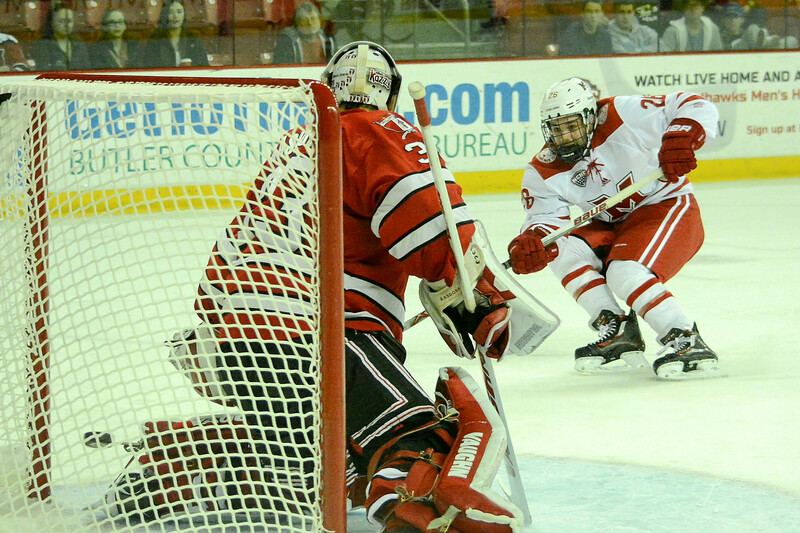 Junior center Justin Greenberg puts Miami ahead for good with this one-timer (photo by Cathy Lachmann). Just 1:43 later, freshman forward Zach LaValle sent a pass through the top of the crease to junior center Justin Greenberg, who buried the tip-in for his first goal of the season. Senior defenseman Chris Joyaux fired a shot into the empty net from his own faceoff circle with 25 seconds left to cap off the scoring. With the win, Miami moved up three places in the PairWise rankings to 28th. Fourteen of the RedHawks’ final 16 regular seasons games will be against NCHC opponents, including next weekend’s home series vs. Minnesota-Duluth. Posted on January 4, 2016, in 2015-16 and tagged Alex Gacek, Andrew Schmit, Chris Joyaux, justin greenburg, Rensselaer, rpi engineers. Bookmark the permalink. Leave a comment.